Just a few weeks ago the child friendly touring production of Beauty and the Beast was performing at our local performing arts center. I was prepared to take my two young daughters to see the show, until I found out the cost for four was going to exceed $165. Beauty and the Beast is fantastic show, I was lucky to see it in New York City about ten years ago. But $165? Was that type of cost really worth the show? While the facility is one of the nicest in western Kentucky, perhaps these types of productions aren’t the most accessible for those in the middle or the lower end of the socioeconomic ladder. Is there a connection between obesity and poverty? 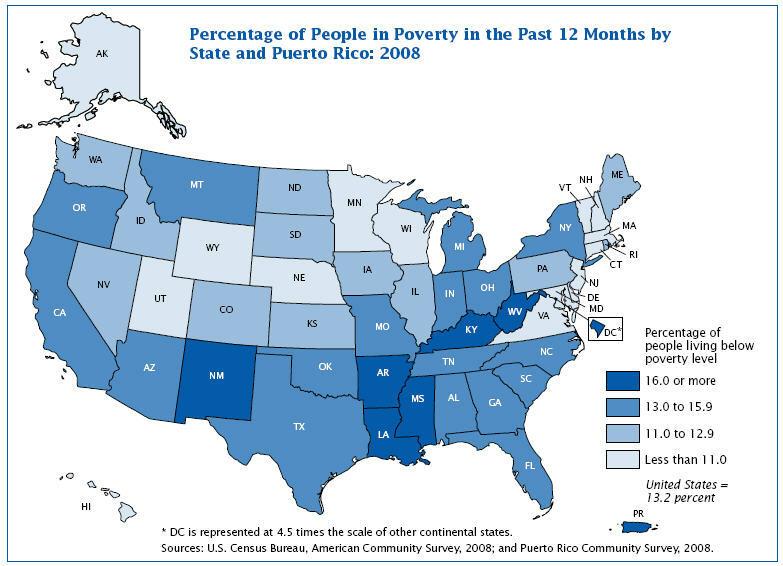 A connection between obesity, poverty, and geography? Sociologists are trained to look for patterns in explaining society and human behavior. Considering lifestyle and entertainment, sociologists identify high culture and popular culture. Do you think social class is a predictor of types of entertainment that people prefer? Are there some types of entertainment that are generally exclusive to the upper class? What types of entertainment do members of the lower social classes engage? Are there patterns? Why? “I’ll have a Big Mac, Filet of Fish, Quarter Pounder, French Fries..icy Coke, Big Shake, Sundae, and Apple Pie…”–yeah, I didn’t need to Google that to find the lyrics, that was from memory. That was a popular “nursery rhyme” when I was younger, a chippy jingle by McDonald’s that served its purpose: to lure me in like the sad fast food sap that I am. I’m sure you can relate, but what is it that can be made of this “McDonaldization of Society”? George Ritzer uses McDonald’s as the primary example to illustrate the modernization of society, a move from cultures built on tradition to cultures that are mechanized and highly organized. The principles that Ray Kroc used to build his food empire have been modeled in businesses from motor companies to coffee: 1. efficiency, 2. predictability, 3. uniformity, and 4. control. 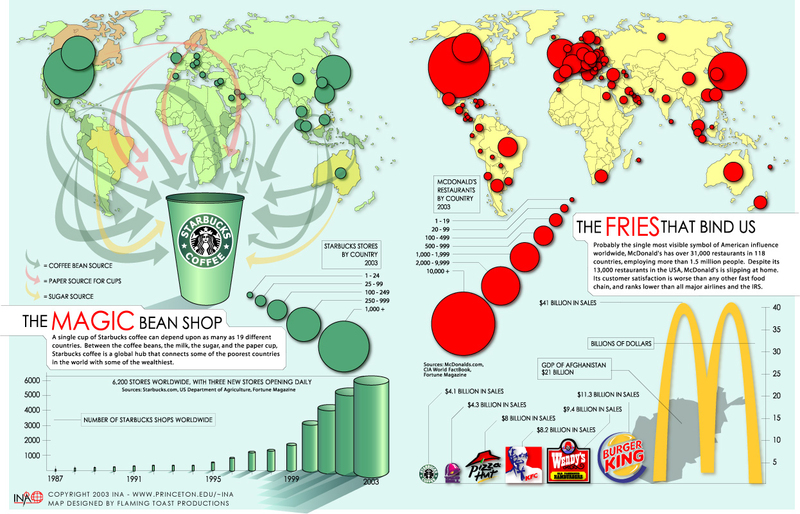 Look at the pervasiveness of both McDonald’s and Starbucks in the world. This graph dates back to 2003, so imagine the extent this pervasiveness has grown over the past seven years. Notice the profit versus the gross domestic product of Afghanistan. To what extent have these principles of economic productivity spilled over into the various groups and institutions by which we associate in daily life? How has the fast food culture come to characterize how we live? Ritzer built on his ideas surrounding McDonaldization and provides an updated and extended version of his analysis with the concept of Starbuckization. Hear some of Ritzer’s thoughts on the role and influence of Starbucks as a global business chain at the video below. Ritzer mentions his focus on structures. How do businesses and the models they employ promote efficiency, predictability, uniformity, and control? Why are these important in terms of profit? How do the business structures affect employee productivity? How do they affect creativity? Innovation? Morale? In what ways is a highly organized bureaucracy good or bad? One of the many parts of culture that both reflects and reinforces values is the media. This happens on all levels of the media, from the lowly commercial to the high-budget action movie, from Ke$ha to opera. But like so much of culture, often we are so immersed in it that we don’t even notice the subtle ways in which our culture is influencing our behavior. I’m not ashamed to admit that I am a fan of Grey’s Anatomy. Yeah, it’s a trashy medical soap opera, but it’s also entertaining. There’s no doubt, either, that Grey’s both reflects and reinforces our values. As I watched this year’s Valentine’s Day episode, entitled “Valentine’s Massacre”, I thought about how values were illustrated within the show. And yes, there are spoilers below the jump. Read the rest of this entry ? ….wait, humor me for a minute. Would you rather celebrate a holiday for its meaning or are you moved by the overload of consumerism that surrounds our holidays? Don’t get me wrong, I like to celebrate events, holidays, birthdays, just about anything. But I have found that the consumerism in my environment, the availability of too much “stuff”, has gotten to be so much of an overload that I’m turned off from celebrating. That’s a difficult thing for me to consider, because I try to focus on the intent of events (why the celebration is occurring). That picture above is not an example of overload in and of itself. 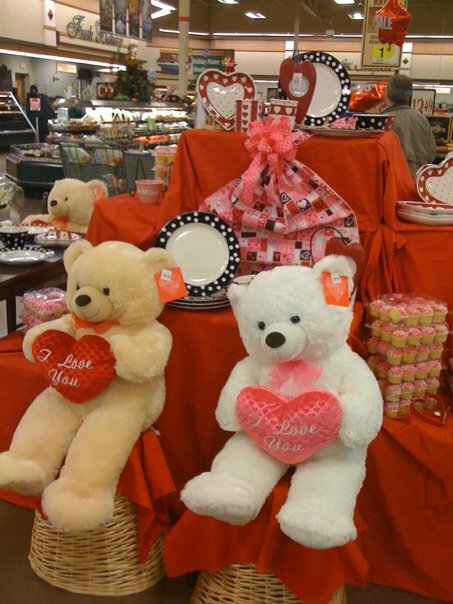 But let me clarify something: that is a picture I took at my local grocery store on New Year’s Day. Doing some last minute shopping on Valentine’s Day a friend I ran into nearly purchased an Easter gift for Valentine’s Day: the marketing and promotions from Easter goodies had mixed in with the Valentine’s Day goodies. Valentine’s Day on January 1? Easter on Valentine’s Day? Do I need to mention when Christmas decorations and Christmas merchandise starts to appear? I suppose what really opened my eyes to the consumerism of any particular holiday season was when I began to uncover the origin of diamonds. Remember: diamonds are a girl’s best friend. If you are going to marry someone in the United States, it most likely will involve an engagement ring and/or a wedding band: with a diamond. Diamonds, much like red roses, are two of the most popular symbols of love in the United States. But what do you know about diamonds and flowers? The movie Blood Diamonds brought international public attention to issue of diamonds mined and produced in conflict torn areas of Africa. Check out this video produced by Current TV that illustrates the issue of country of origin and the conditions by which some of the most sacred objects of Valentine’s Day originate. Do consumers bear some responsibility for their consumer habits? Who, if anyone, should accept some level of responsibility when the market plays unfair? Does it matter? That’s a quote made famous by former Chicago Bears linebacker Michael Singletary, current head coach of the San Francisco 49’ers of the National Football League (NFL). Singletary’s quote speaks to the innocence of spontaneity, play, and competition. While we are early in 2010, we have already witnessed major sporting events here in the United States. It has become tradition at the beginning of each year for the college bowl series to kick high in to gear, signifying the end of the college football season and the crowning of the national college football champions. During the first few weeks of January, college football dominates the sports world in the United States. But as soon as that ends, the NFL playoffs and the Super Bowl are front and center. As I write this week’s post, I’m taking in the Winter X Games from Colorado (might I recommend watching it in HDTV; fabulous!). In early February, the “Super Bowl” of auto racing hits Daytona Beach, Florida as the NASCAR season begins. This year alone after these major sporting events, consider what remains: the NBA All Star game, the Winter Olympics, the PGA and LPGA majors, the World Cup in soccer, and playoffs in every major professional sport. The list could literally go on and on. This is not to mention the role of sports in the elementary and secondary schools and in the backyards and streets throughout the United States and the world. We begin engaging in sports soon after birth, and come to know and love our favorite athletes and teams as we move through adolescence and adulthood. Are we naturally drawn to sports and leisurely activity? What is it that influences someone to play baseball versus soccer, basketball versus volleyball? What is the difference between high culture and pop culture, and how does social class and social position influence us into the types of sports we engage? What role do sports play as part of our culture? A subculture is a group that exhibits some cultural characteristic that distinguishes them from the mainstream society. Most patterns of the group, and the behaviors of the individual members are consistent with the socially acceptable behaviors. Countercultures vary in that their cultural patterns go against the mainstream norms. Often times countercultures engage in behaviors that are consider illegal. Subcultures and countercultures vary over time. The benchmark of gauging a group as a subculture or counterculture are the norms of the society. At one point in history, a group that is now considered mainstream (for example, Christians) were seen as a counterculture. As values, beliefs and attitudes of individuals in a society change, so do norms. Thus as the rules, guidelines, and expectations for behavior in society change, so then does our definition as to whether a group is considered a subculture or a counterculture. Certainly in the 21st century United States, Christianity plays an important role in the culture. A couple of years back I heard the story of the Turtleman in central Kentucky. The Turtleman engages in very odd behavior by current social standards. Given that he is somewhat an isolated case, his behavior is unique in and of itself, but not considered a subculture. There are not large numbers of people that engage in turtle hunting as the Turtleman. Compared to U.S. averages and norms, Kentucky ranks well below the standards for income, education, and other standard measures of achievement in society. While the Turtleman may be a novelty, how do images and behavior like his serve to validate stereotypes and cultural perceptions of “hillbillies from Kentucky”? If Kentucky ranks on average well below the United States average on many socioeconomic indicators, then on some level our stereotypes can be validated. Do habits, hobbies, and behavior vary according to social class? What elements of high culture tell us something about particular subcultures of our mainstream society? What elements of popular culture give us a better understanding of the general patterns of behavior of individuals? How does understanding what groups of people do for fun and entertainment provide insight into their values, attitudes, and beliefs? You are currently browsing the archives for the Culture and Society category.